Have you seen the various rockfish at the Aquarium? Some of these fish are typically found in the deep sea, but thanks to a hyperbaric chamber built by Assistant Curator Nate Jaros and his talented team of aquarists, we’re able to safely exhibit them! He’s here to explain how and why. In order to tell a more comprehensive story of the Pacific Ocean, we wanted to be able to exhibit certain fish that are found exclusively at the rocky depths of the sea, like certain types of deepwater rockfish. However, when you bring a fish up from a deep depth they can experience adverse health effects, just as a diver would if he or she surfaced too quickly. Sometimes the fish’s swim bladder will expand, causing its stomach to protrude from its mouth or eyes to bulge out of its head. The typical recreational fishing method for relieving these issues is to puncture their swim bladder, but that can be a dangerous technique and stressful for the fish. I began looking into an alternative solution for this problem and quickly figured out that a hyperbaric chamber is a safer and less stressful way to depressurize fish. 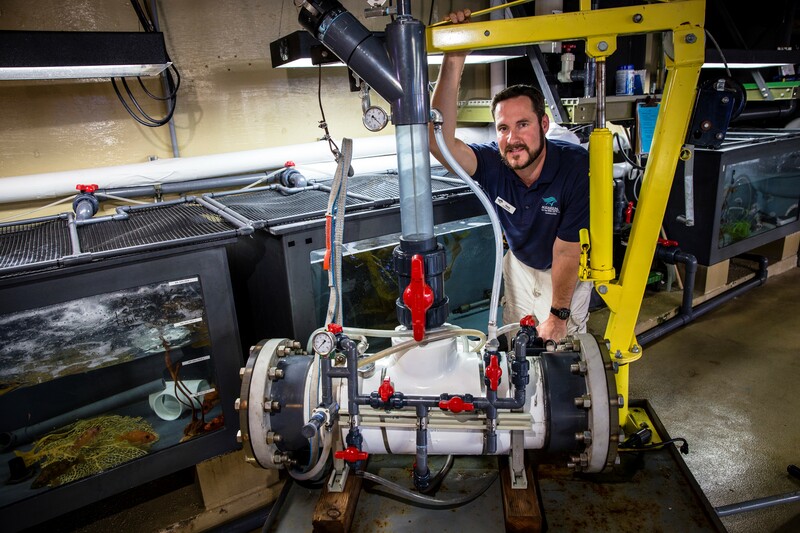 With help from other institutions like Monterey Bay Aquarium and Cabrillo Marine Aquarium, my team and I began to build our own, using basic materials like PVC pipes and gauges. Building the chamber took about four months. Once we were done, we had a fully functioning hyperbaric chamber that allowed us to safely depressurize fish from the deep ocean in just a few days. We’ve also found it helpful in the treatment of our own fish, including syngnathids (i.e. seahorses, pipefish, etc.) which sometimes develop gas bubbles that affect their buoyancy. In fact, the hyperbaric chamber has been such a big hit with our veterinarian staff for treating some medical issues that we may build a second one just for them! You can find rockfish in our Northern Pacific gallery in the Rocky Reef exhibit. Many of our seahorses and pipefish are in the Tropical Pacific gallery.